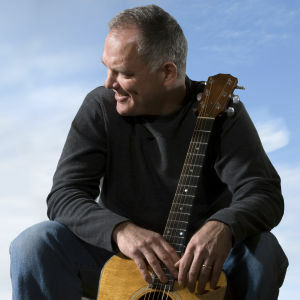 Christine Lavin : JUST ONE ANGEL : LARRY MURANTE Track #14 "Ready For The Dark"
Larry Murante "Ready For The Dark"
Larry Murante’s beautifully woven stories about every day folks, set to song combine compassionate, socially conscious lyrics and an upbeat, joyful, energetic folk/rock style. Jackson Brown, Lyle Lovett, Hal Ketchum and Michael McDonald are all reflected in his music. and an engaging stage presence. international John Lennon Songwriting Contest. Larry tours nationally, performing at folk concerts, festivals, radio interviews and house concerts. About fifteen years ago my wife and I decided to spend Christmas on Orcas Island, the largest of the San Juan Islands in the northwestern corner of Washington State. It’s a 1 1/2 hour drive from Seattle to the ferry terminal in Anacortes and then an hour long ferry ride to this lovely, mostly rural and sparsely populated island (about 5000 residents). We arrived on Christmas Eve and were given some free passes to a Christmas concert that evening while checking into our cozy little cabin on the southwestern end of the island. We had no plans for the evening and decided to check out the concert expecting to see the usual holiday choir and eager to share some yuletide cheer with the local islanders. There were a few inches of new fallen snow on the ground and we were excited to explore. The concert was to take place in a small Victorian style chapel a few miles from the resort and we were told to dress warm because the chapel did not have electricity. We drove through a forest of evergreens on a moonlit, slippery gravel road to a dirt lot where an attendant directed us to park. We opened our car door to the sound of bagpipes floating in from a neighboring field. As we walked out of the parking lot, we could see the small, white chapel at the bottom of a winding lane bordered with luminaries. There was a yellow glow emanating from it’s tall, slender windows and entrance doors. We couldn’t see the piper, but his music filled the air as we strolled down the hill toward the chapel. Inside the chapel, a narrow center isle was flanked by several rows of long pews filled with thickly bundled, mostly local folks of all ages. Overhead, the walls were lined with candle sconces and evergreen and holly branches carefully arranged by some of the island residents (including the island theater director). The smell of pine wafted through the air. It was Christmas Eve in the Northwest and there was a celebratory, festive spirit all around. Suddenly the pipes got increasingly louder from behind the closed doors of the sanctuary and John Newton’s, “Amazing Grace” resonated through our bones as the doors were slowly pulled open and the angelic presence of a smiling Susan Osborn stood before us; the piper finishing the song just a few steps behind her before turning around and exiting the chapel. A few seconds of total, rapt silence, then Susan sang the words of the beloved hymn without accompaniment. For nearly twenty five years, this world renowned singer and former vocalist for the Paul Winter Consort, songwriter, recording artist and Orcas Island native celebrated Christmas and the coming of winter with this traditional holiday concert. She proceeded to mesmerize with her amazing, operatic, soprano - mostly a cappella, occasionally with guitar - for the next hour. Walking back and forth down the center isle, she lead us in song, shared her stories of family, her life as well as traditional holiday folklore. It was the most amazing concert and one of the most memorable Christmas Eves my wife and I have ever had. We left the chapel that evening transfixed to an earlier century, to a simpler, less complicated era and an even greater appreciation for the power of song and tradition. I was fortunate enough to be a musical guest of Susan’s in that very same chapel on Christmas Eve a few years ago. Yet another fabulous holiday memory.